The Dumbarton Combination, formed in 1861, comprised the 13 parishes of Bonhill, Buchannan, Cardross, Drymen, Dumbarton, Kilmaronock, New Kilpatrick, Old Kilpatrick, Kippen, Luss, Port of Monteith, Roseneath and Row. The total population of the member parishes in 1881 was 67,409. The Dumbarton Combination poorhouse, designed by James Campbell Walker, was erected in 1862-5 on Townend Road at the northern outskirts of Dumbarton. It could accommodate 134 inmates. An additional infirmary block was added in 1866, probably to house lunatic inmates who numbered up to 60. The poorhouse site location and layout are shown on the 1930s map below. Dumbarton former poorhouse site from the south, early 1980s. The day-rooms have been tastefully repainted; woven spring mattresses have been fitted to the majority of the beds, and the lavatory and bathing arrangements are now said to be satisfactory. A square of linoleum has been laid in the female day-room and easy-chairs have been provided for both day-rooms. In 1913, the poorhouse was partially destroyed by a fire which began in a defective chimney in the main block. The fire occured during the day and none of the inmates was harmed, although a few had to be temporarily be boarded at other poorhouses. The poorhouse later became Townend Poor Law Institution. In 1946 it had 186 beds and a hospital with 78 beds. After 1948, it became Townend Hospital, and then the Central Hospital, providing geriatric care until its closure in the early 1980s. 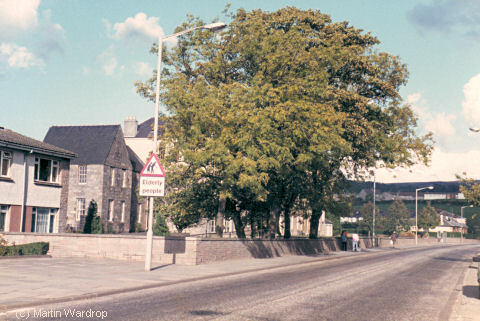 The buildings have been demolished and the Langcraigs old people's home now stands on the site. 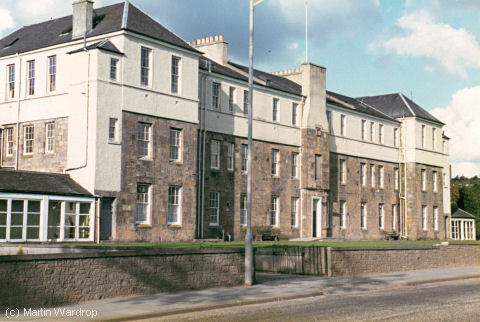 West Dunbartonshire Archives, Strathleven Place, Dumbarton G82 1BD, Scotland. Dumbarton Combination Poorhouse minutes (1861-1954). Thanks to Martin Wardrop for providing the pictures.